A well-designed lesson (see Table 1) integrates these elements, addresses specially designed instruction, and intensifies instructional delivery using formative assessment and progress monitoring (Friend, 2014). 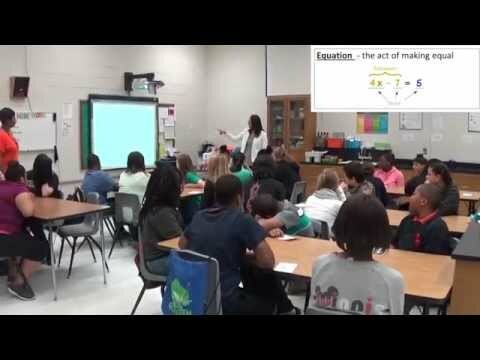 The teachers in the video clips embedded into each section of the lesson plan are co-teachers within a seventh-grade math class. Within this class of 33, eight students are identified as having disabilities, and four of whom have Individualized Education Program (IEP) annual goals related to math or organizational skills. Of the remaining students, several are experiencing difficulty with the concept being taught – one-step equations. The lesson plan design, adapted from “The Math Plan That Really Works,” incorporates components needed to practice new learning and review previously taught concepts. A Mental Math section is included to develop automaticity and fluency with math facts. Fluency difficulties were noted throughout the school, so this component was incorporated into the daily lesson plan. The needs of the students in this class are also addressed within the lesson plan format through a structure that provides guided practice and independent practice at the concrete, representational, and abstract level (using the concrete-representational-abstract instructional sequence). During the previous day’s class period, the co-teachers introduced the concept of one-step equations. Through formative assessment, they were able to determine students’ knowledge of and comfort level with the new content. Based on these formative assessment outcomes, three students were assigned to the concrete (C) level, 18 to the representational (R) level, and 12 to the abstract (A) level of knowing, understanding, and being able to do (K-U-D). As students enter the room, Teacher One provides index cards with a yellow dot, blue dot, or red dot to indicate students’ group assignment to complete concrete (yellow)-representational (blue)-abstract (red) (CRA) work on one-step equations.Three students will receive cards with a yellow dot (concrete group and specially designed instruction) and a blue dot. Students’ group assignment was determined through formative assessment built into the previous day’s instruction. Teacher Two records attendance and monitors the checklist of students with an IEP goal of bringing all needed materials to class. Students are assigned to representational and abstract groups based on the previous day’s formative assessment. Students will be assigned to groups through blue dots or red dots. Each group will minimally complete two whole-group problems and two problems with partners in this phase. Abstract Group (Red Dots – 12) (Teacher Two) – set of 8 problems in 6 sets; problems will be placed on each side of a colored page; the page will be cut in half in puzzle fashion. After completing the problems, students check with their partner puzzle piece for accuracy of problem completion and report to the hallway to have their problems placed on the hall wall for display. Individual for Specially Designed Instruction (SDI) – 5 to 10 minutes of this section of the lesson; fraction work to address an IEP goal designed by Deb. (5 min.) Wrap-Up: Vocabulary review – variable, etc. Included with this lesson plan are the IEP annual goals to be addressed with specially designed instruction within the inclusive classroom. The teachers progress monitor students’ work and provide the data to the case managers for IEP updates and development. Format developed by the director of special education for the school division. Glossary of terms are available for reference. Allsopp, D. H., Kyger, M. M., & Lovin L. H. (2007). Teaching mathematics meaningfully: Solutions for reaching struggling learners. Baltimore, MD: Paul H. Brookes Publishing. Fattig, M. L., & Taylor, M. T. (2008). Co-teaching in the differentiated classroom: Successful collaboration, lesson design, and classroom management. San Francisco, CA: Jossey-Bass. Friend, M. (2014). Co-teach! : Building and sustaining effective classroom partnerships in inclusive schools. Greensboro, NC: Marilyn Friend, Inc.
Villa, R. A., & Thousand, J. S. (2005). Creating an inclusive school. Alexandria, VA: Association of Supervision and Curriculum Development. By Deborah Franklin, M.A.T., Charlene Gray, M.Ed., Catherine Gregory, M.Ed., Mary Murray Stowe, M.Ed., and Heather Thompson, M.A.